10th February 2019, passed away peacefully at Altnagelvin Hospital aged 68, beloved husband of Anne, grandfather of Caolan & Caoimhe, loved and missed by children Aisling, Ronan & Niall and their partners Dawid, Ann-Marie & Claudia. In keeping with Martin’s wishes there will be no service and there will be a private cremation. Family and friends are welcome to pay their respects and offer their condolences at W J O’Brien & Son’s Funeral Home, 110 Clooney Road, Eglinton on Wednesday evening between 6 pm and 9 pm. No flowers please. 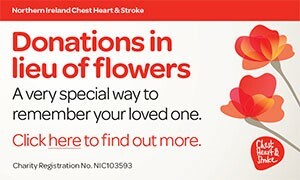 Donations in lieu of flowers if wished to Foyle Hospice, 61 Culmore Road, Derry, BT48 8JE. I am sorry to tell you that Martin DOHERTY has passed away.